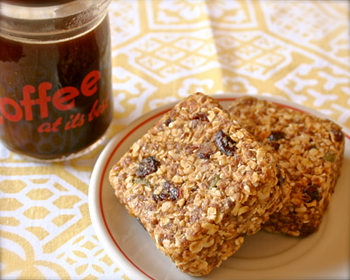 In honor of kicking off the blog this week sweet Twinner's giving away a DOZEN of her Flying Vegan granola bars. A D-O-Z-E-N. Have you tried them before? They are so good I guarantee they'll make you wanna shimmy across your hardwoods in your skivvies shouting GET IN MA BELLY! They are most definitely D to the liiiiiicious. To enter, just leave a comment below by Friday, April 23rd. I'll draw a winner at random and Mr. McFeely will ship your bars on Monday! They sound delicious! I would love to try one too! I am so excited about your blog, Em. I added it to my favorite pages so I can go right to it! oh please let me win, please!!!!!! YUM! I wont some right now! Been a long time! I'll even share with 11 people with high repeat purchase potential if'n I win. oh please oh please oh pretty please pick Kowen? YUMM!!! I would love to try and excited that you have a new blog!! I'm addicted to flying vegan. If you haven't tried the pumpkin muffins on Smitten Kitchen you really should. They are to. die. for. And it was really nice meeting you at the boot party. I'll see you at banquet! Sarah made me a batch as a house-warming gift when I first moved to CA 5 years ago, and I love them still. Sign me up, please! Sounds yummy! I showed your blog to my hubby last night. I told him I was smitten and he laughed. I love it when we make each other laugh. Thanks! thanks for allowing your blog to distract me from boring college classes. you rock. These bars are the BEST!!!! These bars are soooooo delicious. I NEED some! Emily, where did you get that coffee mug? I love it! And I would love to try some of those delicious-looking granola bars. Thanks! I'm willing to try anything! Love your blog! Love your website friend! These goodies look delish! Me me me me me! I love those bars and miss them terribly!! Send me a treat!! Maybe then I'll stop eating all those bad for you sweets! Hope you're all doing well! Emily-- congrats on the blog! I love your letters! You and Tim are so sweet! Yummers! And probably better for me that Thin Mints! Keep up the good work...love The Letters. I Love, Love, Love that you have started a blog, and I wanna win those yummy-lookin' granola bars. Here's my entry! Proud of you girl!!! Love your blog! I want to be your friend. :) And- I want some granola bars. Also- my mailman did not appreciate my Mr. McFeely reference today. I later considered that he was taking the name more literally. Trying to explain myself over my ferociously barking dog was not helping. 1. I sleep with my blankie underneath my pillow. I think Twinner would award this brave act of loyalty. 2. I know that the state fish of Hawaii is called "Humuhumunukunukuapua'a" and I know how to pronounce it. Have I mentioned I know about the soon to be had trip to Hawaii? I do. 3. I left the very first comment but this blog ate it up. I choose to believe that your blog finds me tasty, instead of believing that it wants to gobble me up. Tho' I am nummy. 4. I know that Twinner likes to eat Raw Young Coconut, which always makes me think of Fine Young Cannibals. Hook a brother up with those bars. Love the site!! I would like to try your sweets. I love it and I'm so excited to share these super fun ideas. not having a clue what this joke is about but... like becky I can also pronounce the name of the Hawaii state fish AND my hubs owns a shirt with it written across the back. BEAT THAT PAGE!!! I know twice is illegal, but it makes me feel luckier! I would love to win those, and would just like to point out that Suzanne has entered twice.